President Donald Trump faces deep challenges on international and domestic issues alike, with a job approval rating mired in historic lows, a broad sense he’s done more to divide than unite the country and a high level of public distrust that he’ll act responsibly in dealing with North Korea. See PDF with full results here. Views on North Korea underscore trepidations about Trump on the global stage. 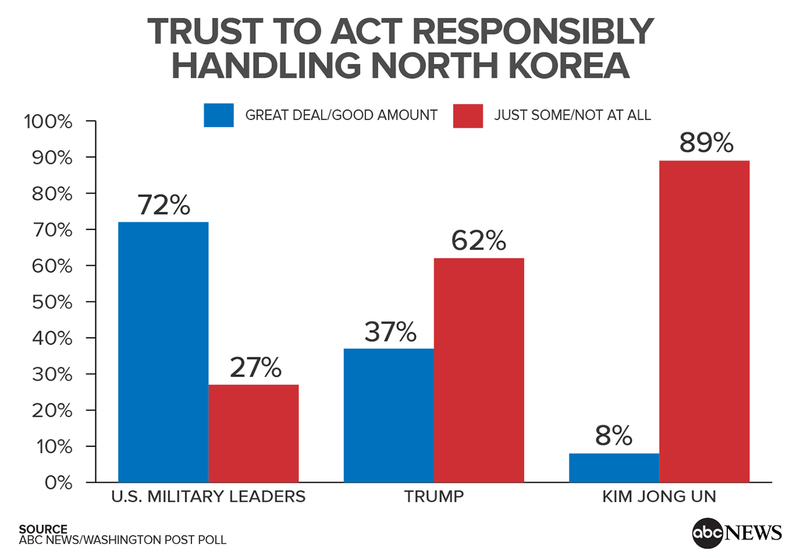 Even as a record number of Americans see North Korea as a threat, the public by a wide 62-37 percent does not trust Trump to act responsibly in handling the situation. Compare that with trust in U.S. military leaders; at 72 percent, it’s about double the level of trust in their commander-in-chief. But Trump faces equal difficulties at home. His approval rating is the lowest of any president at eight months in office in polling back 71 years. The public by 66-28 percent says he’s done more to divide than to unite the country, considerably worse than the highest “divide” scores for his two predecessors, Barack Obama and George W. Bush, both 55 percent. And despite his “drain the swamp” promise, Americans by 59-39 percent say Trump has not brought needed change to Washington, 6 percentage points more than Obama’s worst rating on this gauge, which came after nearly two years in office. Eight months in, 39 percent of Americans approve of Trump’s performance in office overall, while 57 percent disapprove. Both precisely match his average ratings in four ABC News/Washington Post polls since he took office. His approval rating remains the lowest for any president at this point in polls dating back to Harry S. Truman’s presidency. Strong critics of Trump, moreover, far outnumber strong supporters, by 48 percent vs. 26 percent in this poll, produced for ABC News by Langer Research Associates. That 22-point gap is the same as Obama’s career worst. But the average edge in negative intensity throughout Obama’s two terms was just 6 points. It’s averaged 21 points to date for Trump. There is differentiation in Trump’s approval ratings on individual issues. On immigration, just 35 percent approve, and 62 percent disapprove. 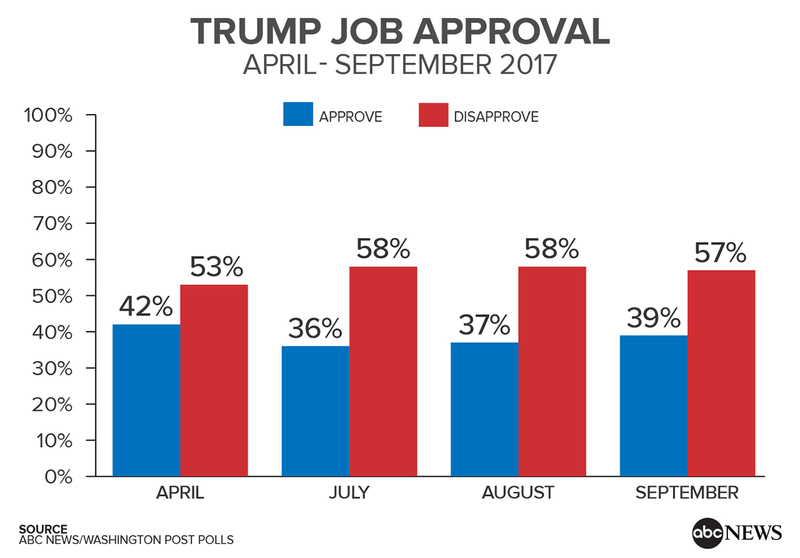 On the economy, his approval advances to 43 percent, with 49 percent disapproving. And his ratings turn positive when it comes to handling the recent hurricanes that struck the United States: Fifty-six percent approve, 31 percent not. Hurricane response ratings are a notable bright spot not just for Trump but for the federal government more broadly. It gets a 70-24 percent positive rating for its hurricane response, a result that suggests lessons learned from Hurricane Katrina in 2005. About two weeks after Katrina hit, just 38 percent of Americans approved of the federal response, and 62 percent disapproved. That said, positive views of the federal response were somewhat higher, 78 percent (among likely voters), immediately after superstorm Sandy hit the Northeast coast in 2012. And negative views are 19 points higher now than after Sandy, with fewer unsure. Regardless, the hurricane response ratings are a clear positive for Trump and the government. So, too, is response to the Trump/Democratic agreement to fund disaster relief while also raising the limit on the national debt. Sixty-five percent support it, on an unusually bipartisan level — including 77 percent of Republicans, 67 percent of Democrats and 62 percent of independents. A record 84 percent of Americans now see North Korea as a threat to the United States, and 70 percent see it as a serious threat; both have been high, but not quite this high, in four ABC/Post polls since 2003. While Trump is seen as a wildcard – as noted, 62 percent don’t trust him to handle it responsibly – that’s even more so for North Korean leader Kim Jong Un. Eighty-nine percent don’t trust him on the issue. 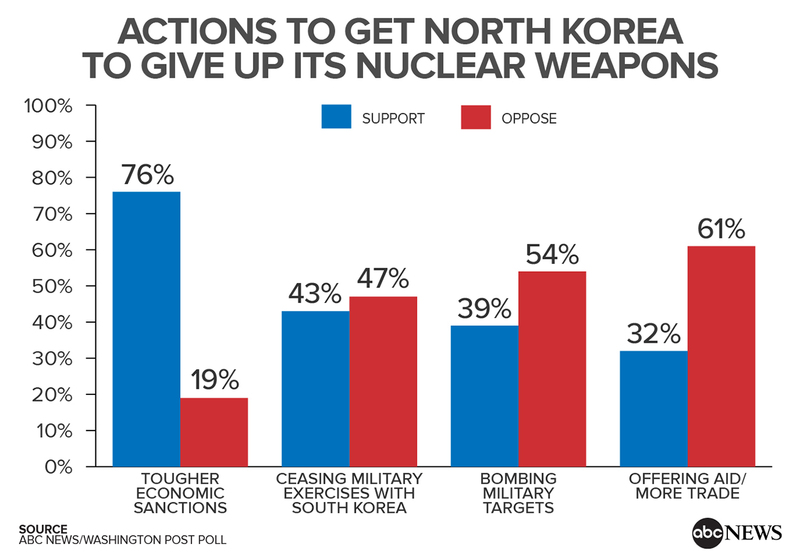 Tougher sanctions are by far the preferred approach in dealing with the situation, with 76 percent support. Backing for other responses falls below half: Forty-three percent for discontinuing joint U.S.-South Korean military exercises, 39 percent for air strikes on North Korean military targets and 32 percent for offering North Korea financial incentives. Showing a hardening of attitudes, support for offering North Korea aid or trade incentives to give up its nuclear weapons has fallen sharply since tensions last were this high in 2005, from 51 percent then to 32 percent now. Concurrently, support for a U.S. strike on North Korean military targets has grown sharply, about doubling from 20 percent in 2005. Still, however, 67 percent say any U.S. strike should be retaliatory only, while just 23 percent favor a preemptive attack. A central reason is that 82 percent think a U.S. first strike could risk starting a larger war in East Asia; 69 percent see this as a major risk. Compared with 12 years ago, the rise in support for air strikes is broadly based, excluding younger adults (under 40) and liberals. It’s up 34 points among Republicans and 21 to 27 points among conservatives, adults age 40 and older and political moderates. Declines in support for aid or trade incentives, while again broadly based, are largest among Republicans, conservatives and whites, down 29, 26 and 25 points, respectively. There are wide if now-customary gaps in Trump’s ratings, and not only political and ideological ones. His overall approval rating is 16 points higher among men (47 percent) than women (31 percent) and among Americans age 40 and older (45 percent) vs. those younger than 40 (29 percent). There also are sharp differences moving from rural to suburban to urban residents (54-41-28 percent approval). He has 42 percent approval among those who aren’t college graduates vs. 29 percent among those with postgraduate degrees. Among the largest divisions, 49 percent of whites approve vs. 19 percent of nonwhites. And within the white population, Trump’s approval rating ranges from 66 percent among non-college white men to 31 percent among college-educated white women, key voting groups in the election that brought Trump to power. Trump’s 77 percent disapproval among nonwhites matches its previous high in April, and the number who disapprove strongly, 65 percent, is a new high. He’s at a new low among conservatives, albeit one of his best groups, at 65 percent approval. His approval rating from liberals, a mere 9 percent, matches its low, while he’s gained ground among moderates, to 36 percent approval now vs. 27 and 28 percent in two midsummer polls. 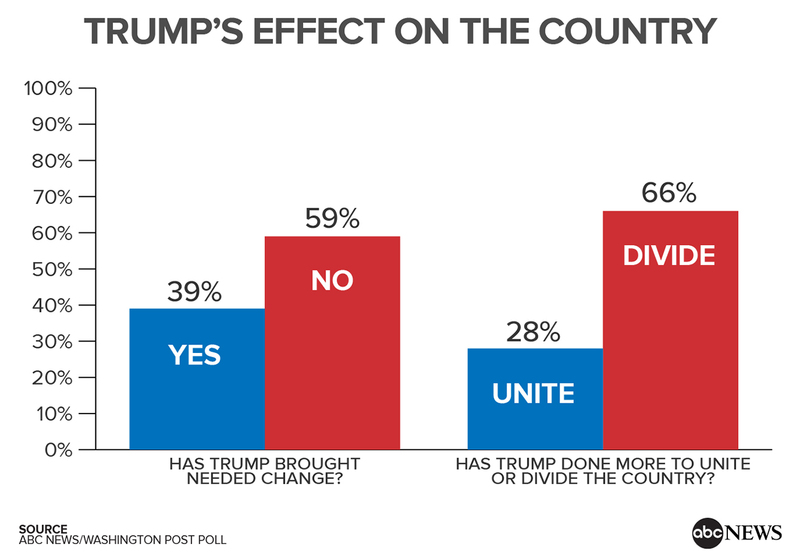 Notably, Trump does less well, even in his higher support groups, on the question of whether he’s done more to unite or to divide the country. Sixty-six percent of Americans say the president is doing more to divide the country. That includes 61 percent of men, 58 percent of older Americans (50 and up, in this case), 62 percent of those without a college degree, nearly half of the rural population, 64 percent of suburbanites and 55 percent of whites — as well as four in 10 conservatives and three in 10 in his own party. This ABC News/Washington Post poll was conducted by landline and cellular telephone Sept. 18-21, 2017, in English and Spanish, among a random national sample of 1,002 adults. Results have a margin of sampling error of 3.5 points, including the design effect. Partisan divisions are 31-23-36 percent, Democrats-Republicans-independents. The survey was produced for ABC News by Langer Research Associates of New York, N.Y., with sampling, data collection and tabulation by Abt Associates of Cambridge, Massachusetts. See details on the survey’s methodology here.